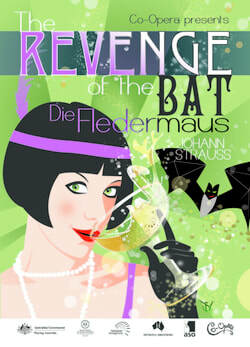 This new production of Revenge of the Bat (Die Fledermaus) is a winning match for Co-Opera’s unique, vivacious and irreverent style. Sung in English, it is set in the glamorous high society of 1920’s Art Deco Australia. In a prologue, Dr Falke tells how his best friend Eisenstein, after a drunken masked ball, leaves the Doctor naked in the centre of town with only his mask to cover his crown jewels. Thus the stage is set for the wonderful music of the Waltz King, Johann Strauss, to lead us on a merry musical chase, with a cast of loveable characters. Fun, mayhem and lots of champagne.